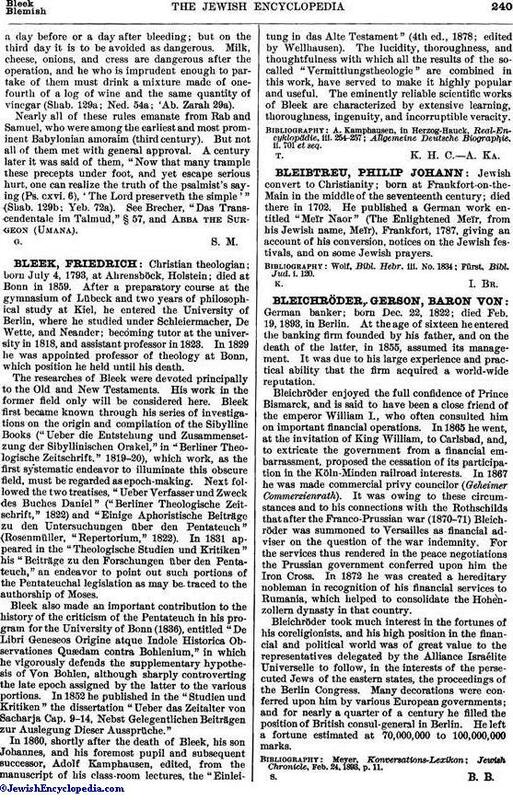 German banker; born Dec. 22, 1822; died Feb. 19, 1893, in Berlin. At the age of sixteen he entered the banking firm founded by his father, and on the death of the latter, in 1855, assumed its management. It was due to his large experience and practical ability that the firm acquired a world-wide reputation. Bleichröder enjoyed the full confidence of Prince Bismarck, and is said to have been a close friend of the emperor William I., who often consulted him on important financial operations. In 1865 he went, at the invitation of King William, to Carlsbad, and, to extricate the government from a financial embarrassment, proposed the cessation of its participation in the Köln-Minden railroad interests. In 1867 he was made commercial privy councilor (Geheimer Commerzienrath). It was owing to these circumstances and to his connections with the Rothschilds that after the Franco-Prussian war (1870-71) Bleichröder was summoned to Versailles as financial adviser on the question of the war indemnity. For the services thus rendered in the peace negotiations the Prussian government conferred upon him the Iron Cross. In 1872 he was created a hereditary nobleman in recognition of his financial services to Rumania, which helped to consolidate the Hohenzollern dynasty in that country. Bleichröder took much interest in the fortunes of his coreligionists, and his high position in the financial and political world was of great value to the representatives delegated by the Alliance Israélite Universelle to follow, in the interests of the persecuted Jews of the eastern states, the proceedings of the Berlin Congress. Many decorations were conferred upon him by various European governments; and for nearly a quarter of a century he filled the position of British consul-general in Berlin. He left a fortune estimated at 70,000,000 to 100,000,000 marks. Jewish Chronicle, Feb. 24, 1893, p. 11.